Sparkle & Pomp offers a stress free process, allowing you to customize, embellish, and enhance your wedding dreams. Our designs are handmade and constructed with only the finest quality fabrics, crystals and beads. No matter what price point you choose, you can be assured that the finished product will be beautiful, fitted to your needs, and add the extra touch to your perfect day. Owner and designer, Samantha Janetos, has a Bachelor of Design: Fashion Communications from Ryerson University. She is also a certified wedding planner through the Wedding Planners Institute of Canada. 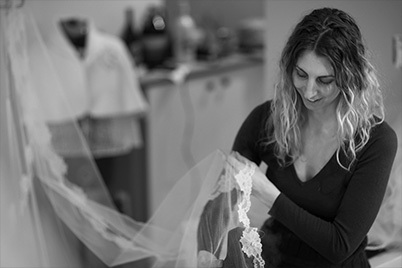 Having spent 10 years working in the bridal industry, Samantha has a vast knowledge of what brides want. She started her career at Patricia’s Bridal Salon where she quickly learned what style and colours looked best on each individual bride. She expanded her sewing skills while working for ‘Cover your World’, an interior designing company. Samantha then branched out from there and honed in on her creative spirit while working with Stephita Invitations where she worked as a design consultant for many brides and grooms. With her outgoing personality and informative suggestions, Samantha brings a wealth of knowledge which helps make her brides feel at ease when first meeting and working with her on their custom design.